This was posted on Facebook months ago but did not go viral. 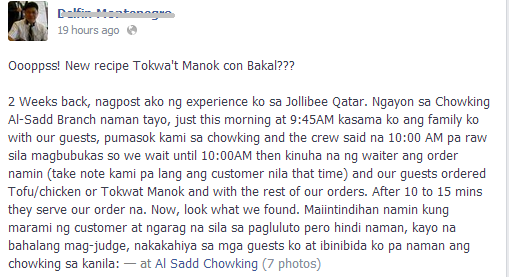 Chowking management was fast enough to act on this matter with the dissatisfied costumer. 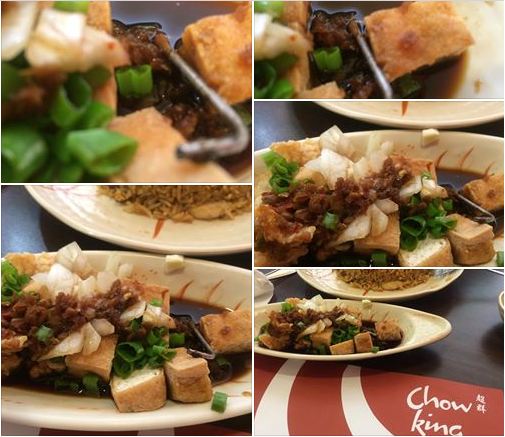 According to the poster, they ordered chicken and tofu and was served with additional piece of metal ingredient as shown on the photo's above. Chowking was the first Filipino fast food opened in Qatar in 2009 so all the Filipinos were really eager to taste its famous meal from back home. There was a lot of kabayan waited outside on its opening day. It was a long line but worth the wait. The service was not the best but at least they tried so hard to please the hungry costumers. In the past year, the service and quality of food has changed because of poor management. Some of the posters friends were enthusiastic about sharing their experiences with Chowking. Dixie. kami nmn nagtake out s chowking dar al salam binayaran nmn nmin lhat at kitang kita ko pa n chinek nla order nmin kya nd n kmi ngdouble check pagdating s bahay kolang ang order nmin tas tomwag kmi sknila para mgtanong kami pa ang tnanong kong san rw ang recpt eh db knokoha nila un at nd n bnblik s customer. At san daw rcpt. Kapikon tlga! Ariostus. Dapat turuan ng leksyon yan.. lalo n sa take out nila.. minsan take out kami.. yung mga sauce nila di tinatakipan mabuti...ayun nagkalat sa loob pati sa loob ng kotse tumagas... itinawag namin sa store mismo hindi n pinakausap yung mismong cashier na nagbigay sa amin order....PASENSYA lang....hindi naman rush hour nung pumunta kami dun..
Anne. hahahaha sister ko langaw nmn nkita sa food nia. What a bummer! They now have a wrench as an ingredient? 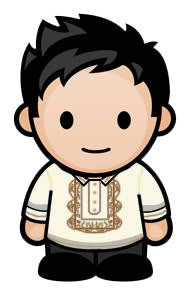 Something new indeed..
lol! i really thought this is a new offering!